Mums, Dads, Grandparents and Child Minders are all welcome! 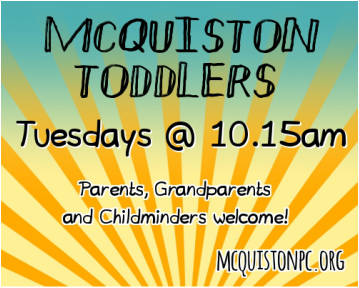 McQuiston Toddlers is a really friendly group, where your children can play together in a safe environment. We share breakfast together at 10.15, with Tea, Coffee and an assortment of goodies for us, while the children have toast, fruit and juice! All Children aged 0 - 4 are welcome! On a Thursday Night, we run a Community Children’s Club, called Transformers. Come along for Fun Games, Snacks, Stories, and various activities during the year! MnM Kids meets during Morning Worship on a Sunday, and is a place where Children can learn about Jesus through stories, games, and crafts. This is a time for the kids to meet with others their own age, and learn and share through praise, prayer, play and fellowship with one another! Our Kids usually join with the main Church Family Gathering at 11am before leaving for MnM Kids!